Now I think the idea for hocking on his spare weapons to his belt was great. 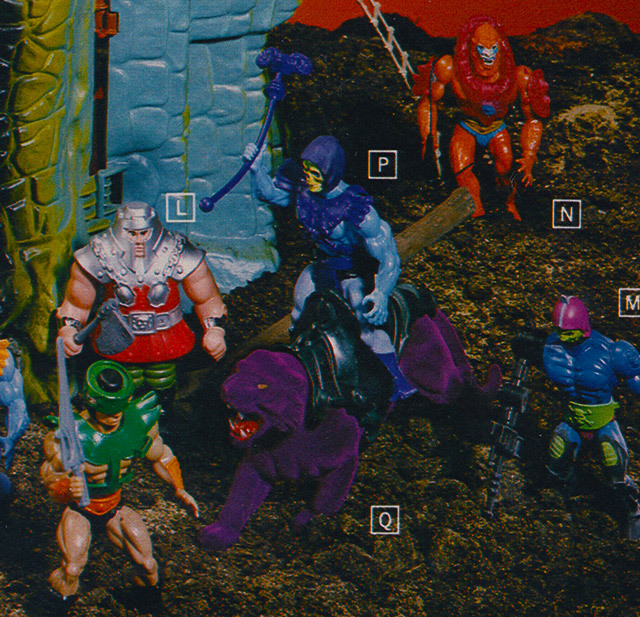 Too many toys (including the MOTU line) have spare bits which you have no place to store them. Sometimes they release things like the Weapons Rack (or to a lessor degree, Battle-bones) but you still have lose stuff that is the first to go missing, or lost at the bottom of a toy Chest. Having them clip onto the belt keeps them together. looks like at first, they seam to want to go with the pulley wheel on the head before just having a hole, which is probably for the same kinda thing? the same way as sticking a bit of rope through the wheel, which would have probably been very weak, having just a hole for the rope does the job but a bit stronger.. however, I don’t think it was EVER used for such reason, nor had anything released that worked with it. The Arm could probably have been given an elbow or something like that early plan said BUT, no other toy at the time did have articulated arms.. so unless they went for a punching feature or something, it seams odd to include that. probably why it was scratched out early. 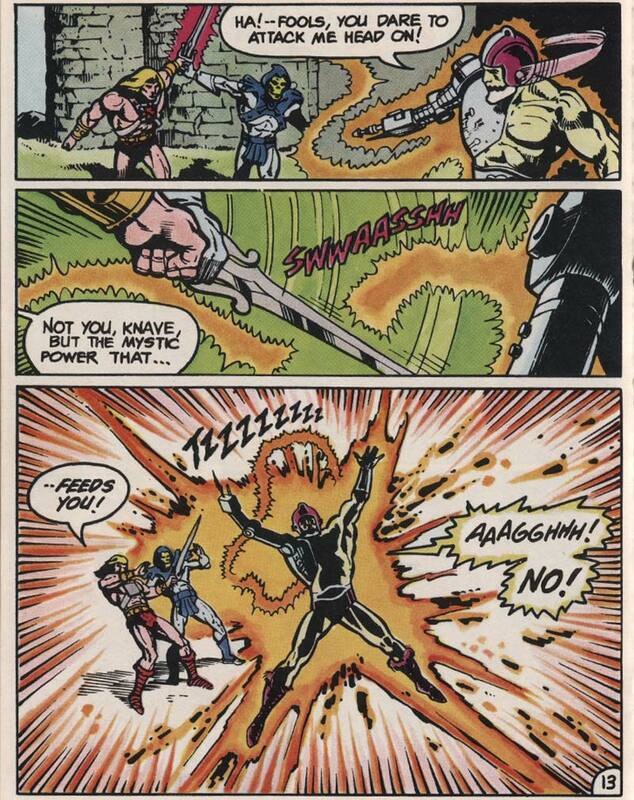 of course, I would have said the change of the X-man name might have not had as much to do with the Marvel comic (which for some time didn’t really used ‘Man’), but the Adult computer game ‘X-Man’ which had.. a bit of fuss.. and was just a bad game with bad programmers anyway.. BUT that was in 1983, and it’s probably more likely to have changed because of the Marvel comic. 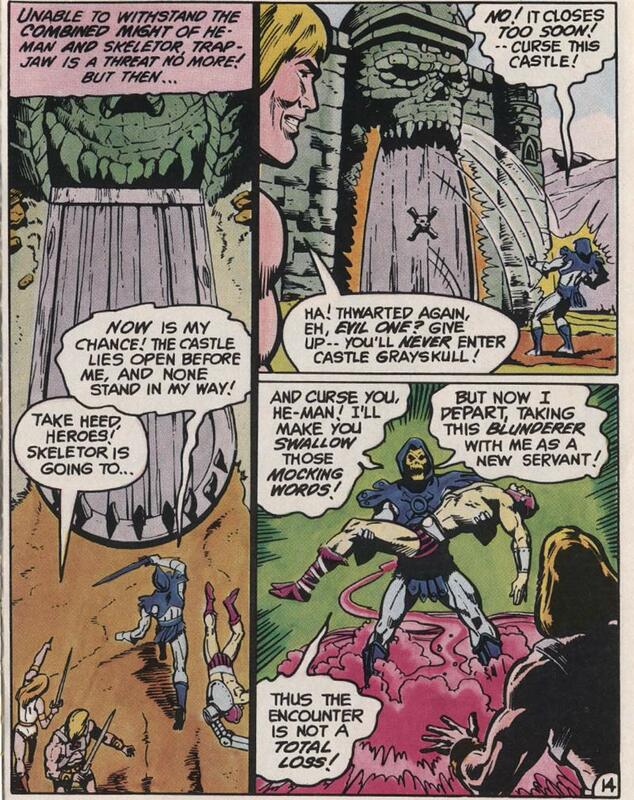 Also, I’m interesting in the reason for them using them legs.. kinda an odd choice as even with the helmet, he comes off a bit on the short side due to there use..
@Manic Man – Trap Jaw uses the hole in his head for a traversing rope in the minicomic. Kids would replicate this by sliding their Trap Jaw from above by hanging him from a piece of string. Ah.. the amount of the mini-comics I don’t have comes into play.. Also, Trap Jaw isn’t one of the figures I owned ^_^. Surprised it didn’t break all the time though.. 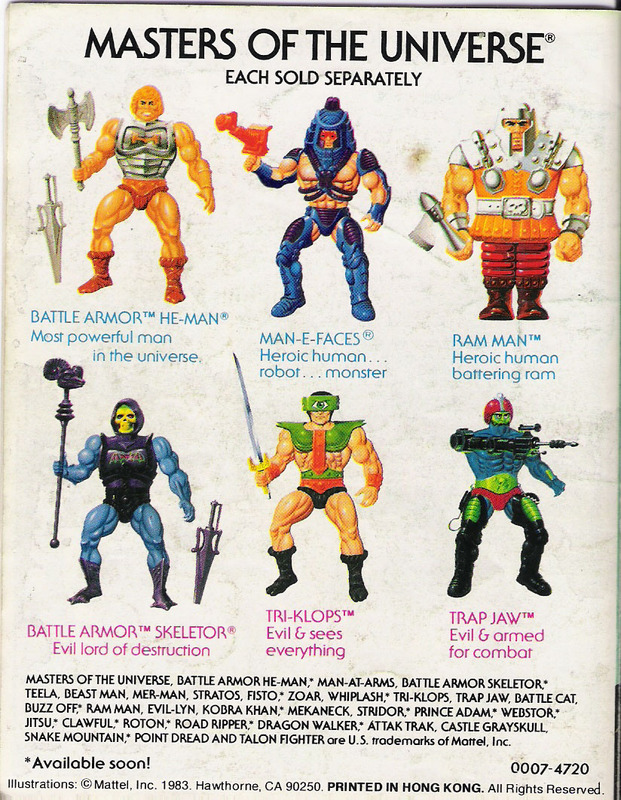 I would guess they wanted to reuse the Man-E-Faces legs because they look a bit more technological than the He-Man legs. 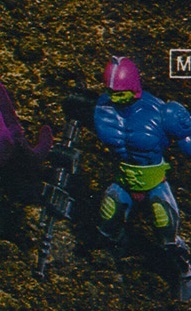 But they are definitely on the short side, similar to Beast Man legs really. 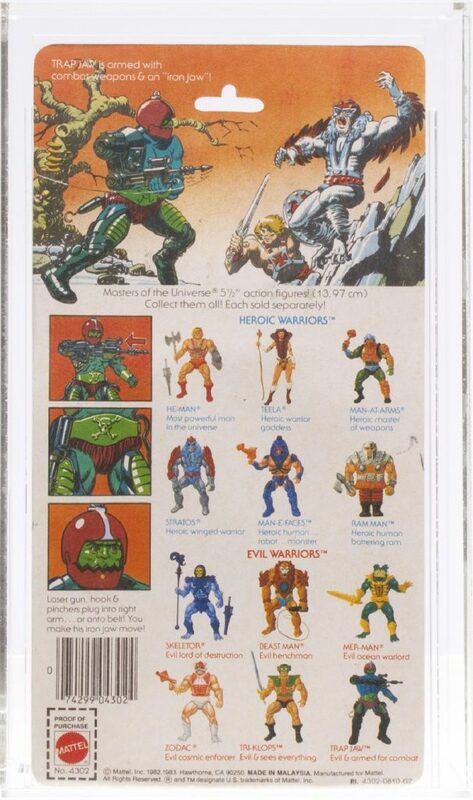 Regarding the messed up cross sell art, the errors appears on the back of third wave mini comics though, while Trap Jaw’s cross sell art is correct on the back of second wave packaging. I wonder if the artwork wasn’t assembled in pieces, so they could reuse parts that were common to multiple figures (chests, legs, etc). Maybe they lost the Jaw and chest overlay pieces. Just a theory, I don’t know for sure. 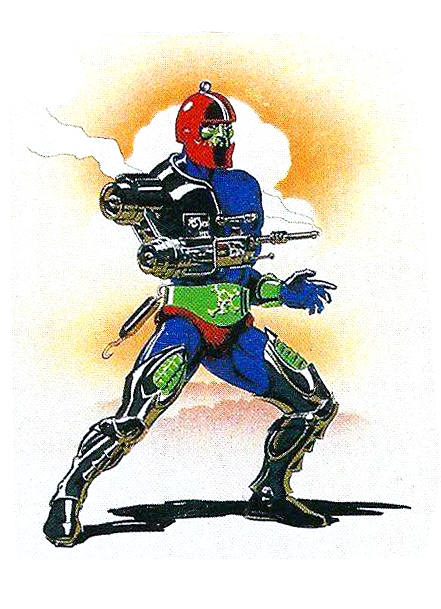 i remember viewing a chapter of mazzinger z (aka shogun warriors) with a robot named spartan k-5 , in mexico was on air at the same time than m.o.t.u. 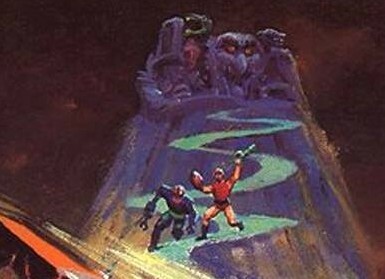 appears , and a mer-man like robot appears in the next chapter!!! 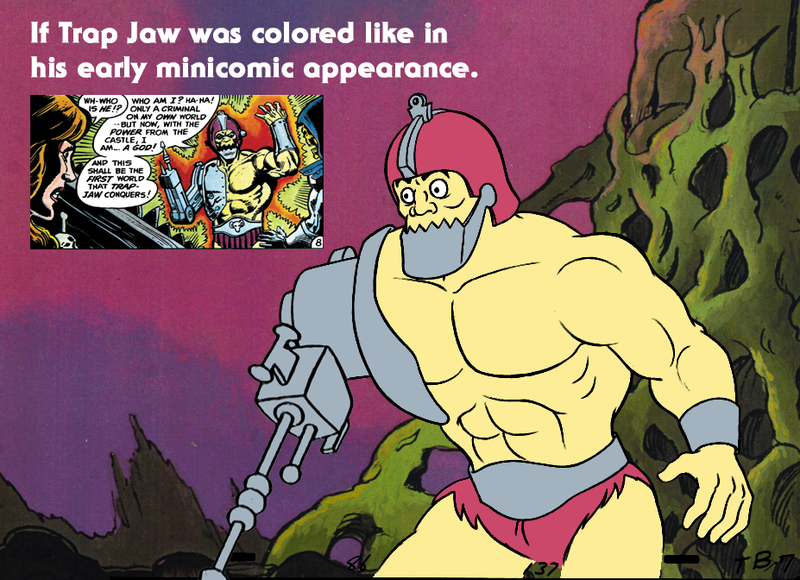 That yellow-skinned mini comic Trap-Jaw is very funky! 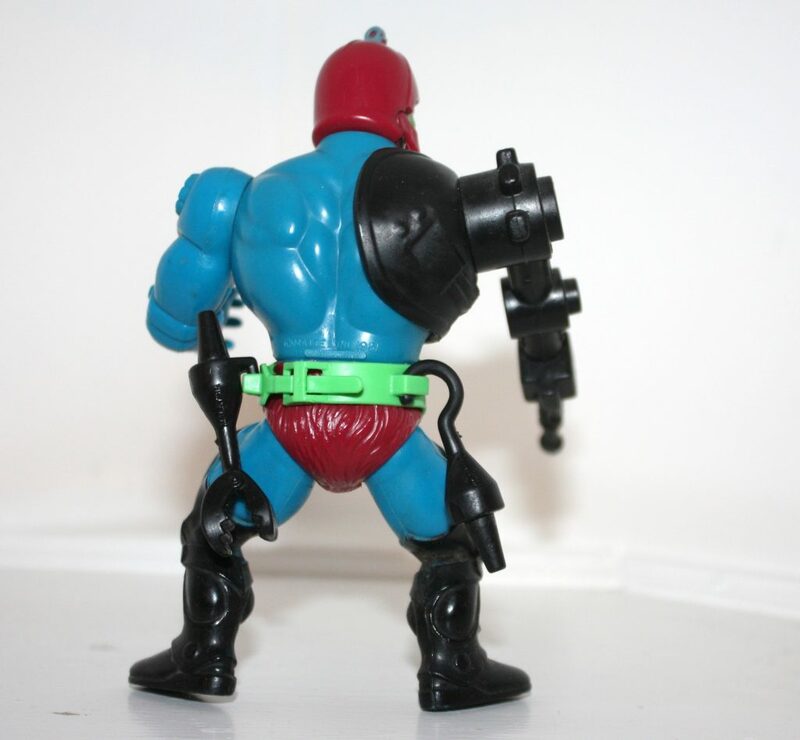 It always bugged the hell out of me that they left off the “bicep” section of Trap Jaw’s mechanical arm in the animated show, so that his attachments plugged directly into the shoulder portion. It always looked so odd. About his skin it never bugged me: I always assumed that his skin was green and that he wore a blue suit as part of his armor. 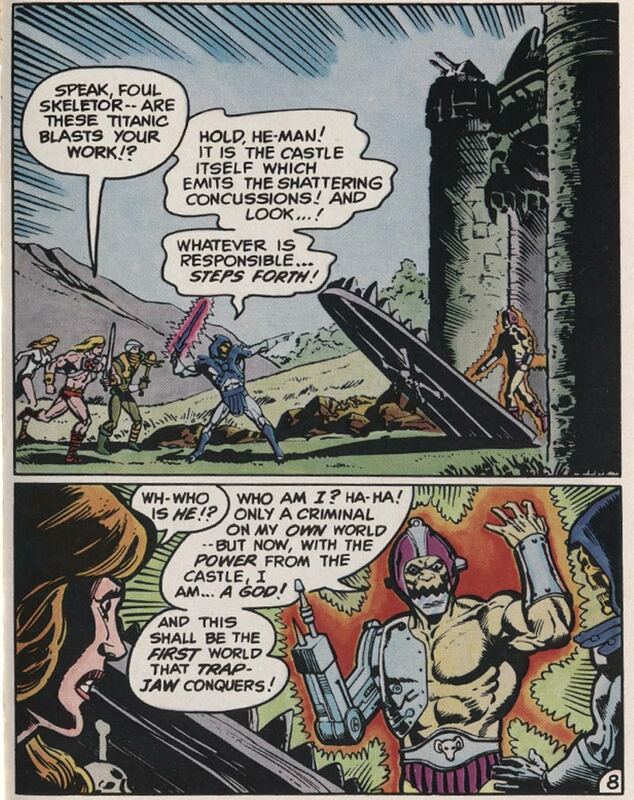 As a little kid, Trap Jaw gave me the feel to be a very bad guy because I reasoned that someway he lost an arm and the jaw and yet he continues in doing mean things: only a very evil person could have such dedication. I were a bit displeased that his depiction in the cartoon was the usual bumbling idiot, but still I enjoyed when he was showed chewing things and using his arm attachments. I never liked his 200X depiction: even more bumbling idiot and the transforming arm simply lacked the charm of the attachments manually changed. 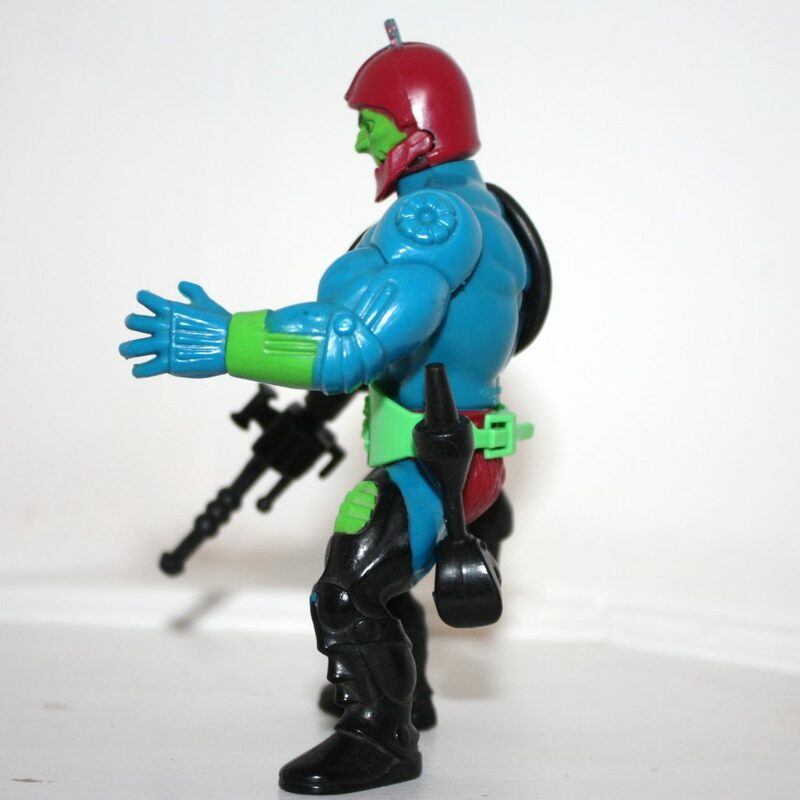 Trap Jaw is also the figure that sparked my hobby of restoring/customize (may I dare to say also “improving”? 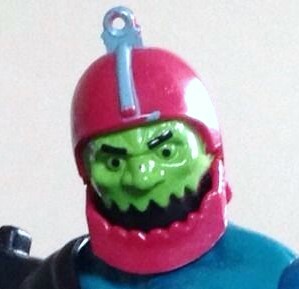 XD) my vintage MOTU. Checking out my collection stored in my basement, I discovered that suddendly a number of figures started to suffer from the infamous “sticky and greasy” secretion. Little digression: for who may does not know about it, is a chemical byproduct caused by age in some kind of plastic and is not a nice an maybe is even toxic, I don’t know. 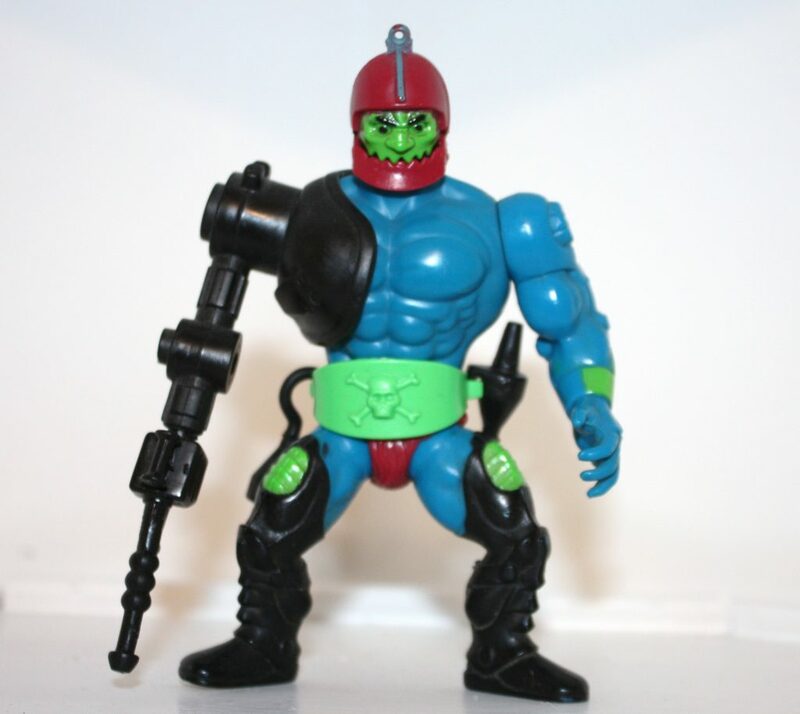 It may afffect vintage MOTU figures made in Mexico and Malaysia due the plastic used and it happens with the legs and any other part made with the same “rubbery” plastic (in the case of Multi-Bot, the whole figure…sigh). All of my affected figures are in fact made in Malasya. 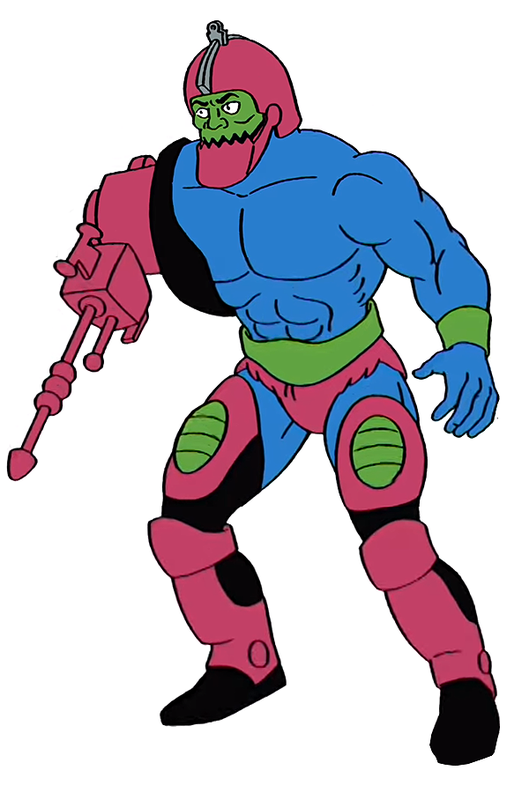 Second only to Faker (and excluding He-Man and Skeletor themselves), Trap Jaw is my second favourite character in the entire MOTU universe. He’s just so awesome, so creative… and in a line that was only in it’s second wave, long before the very gimmicky entries of later waves… he just seemed so different, truly from another dimension! Evil today I often find myself sketching him here there and everywhere. 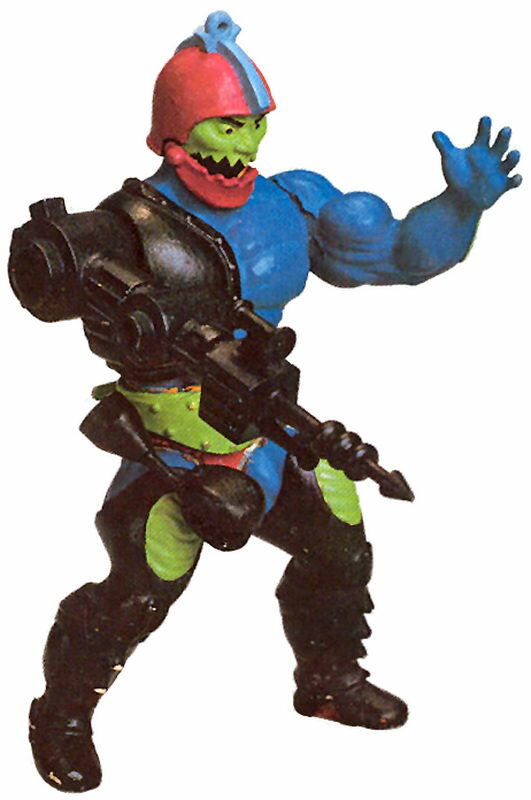 I acquired my original childhood Trap Jaw by a mail away offer, where you had to cut out and send off a certain number of ‘proof of purchases’ from back of figure boxes. 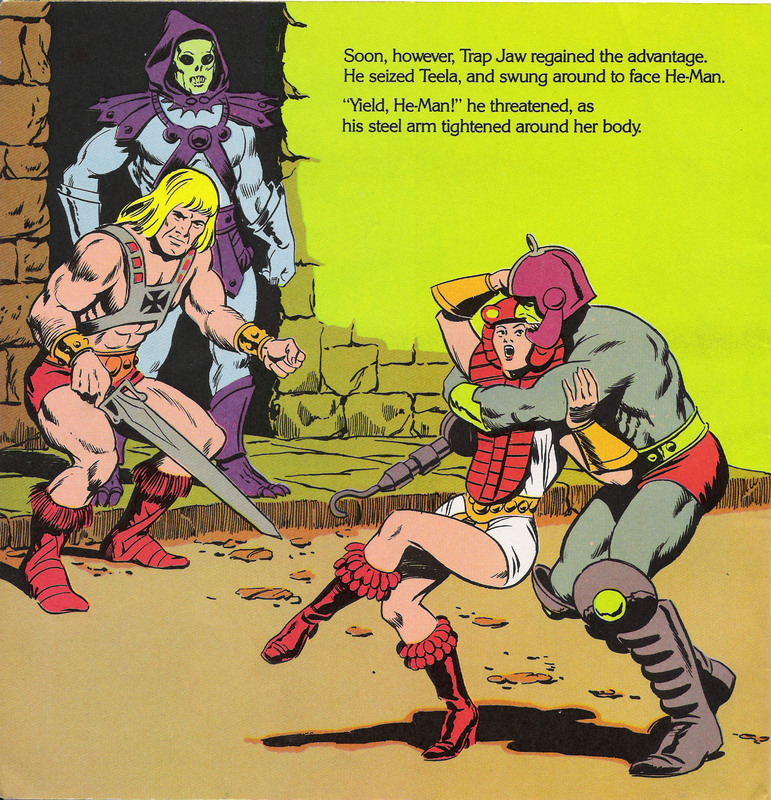 I can remember finally saving enough proofs… choosing Trap Jaw from the several options on the form… mailing it all away…. excitedly waiting… receiving a letter saying there was a delay due to popularity… until one day he finally arrived in the post. Actually, the day he arrived we were all at school/work, just to make that painful wait even longer, so I had to traipse with my mother that dark and rainy evening to the sorting office in town to FINALLY get my Trap Jaw. But he was worth it – an awesome figure! I loved TJ from the off and he was an instant favourite, but I don’t think it was until a year or two later when looking back at the early line (which had by then got into the more gimmicky “anything goes” stages) that I realised just *how much* he stood out over the majority of the other figures. Such a great concept, and well executed… and so many accessories (three weapons, plus belt, and moving jaw… wow). The right arm looked mildly clunky, I longed for it to be articulated in the middle, but for an already ‘deluxe’ figure I didn’t mind. Interestingly, my childhood TJ’s jaw didn’t snap shut. I’ve lost in the mists of time if it ever did or not – if it arrived okay and I unknowingly broke it during play early on, or if it was produced dud. But it never affected my play enjoyment any. 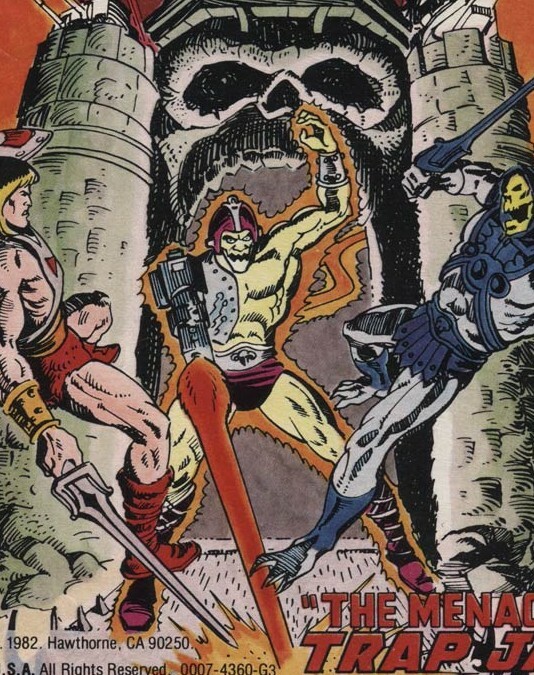 My TJ came with a different mini-comic to “The Menace of Trap Jaw!” mini-comic, so I didn’t actually see that comic until some years later (although green TJ could be glimpsed in “The Magic Steeler!”) but I loved the story of a crazed killer escaping from a parallel dimension… where Castle Grayskull also exists (that was a far-out concept — why was that never developed further?). And his early design with pale green (some say yellow) skin was amazing. 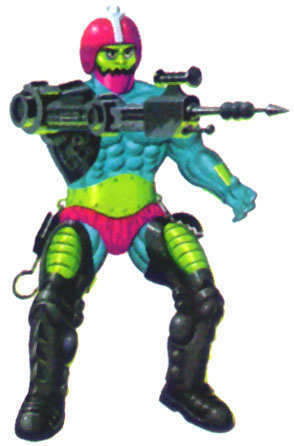 As much as I loved my childhood Trap Jaw, when I saw this early version, I wanted mine in those colours! 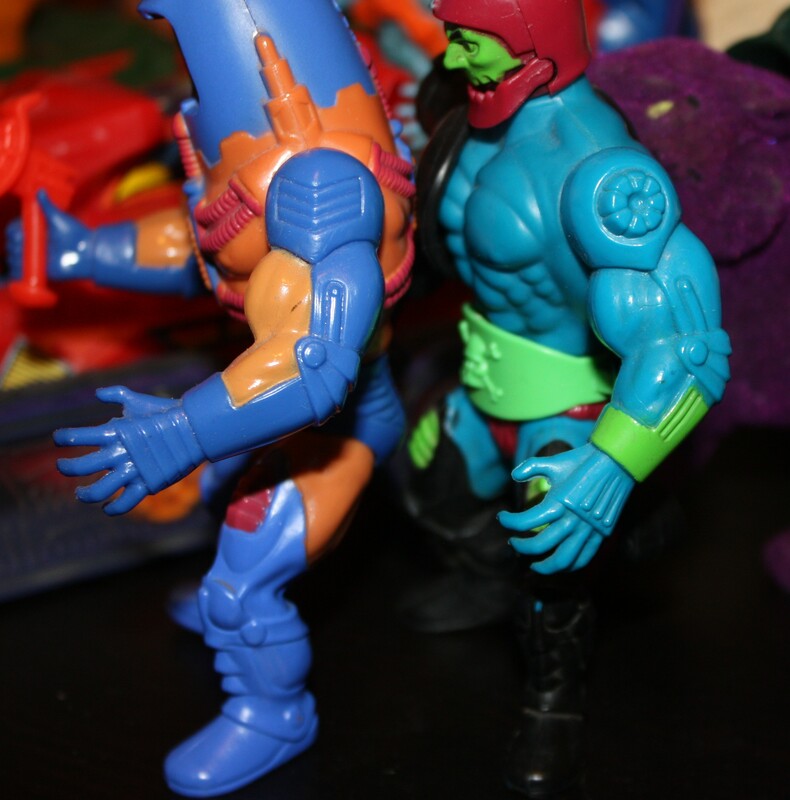 Talking of colours, when collecting the line on the second hand market, I did find a number of colour variations to Trap Jaw. 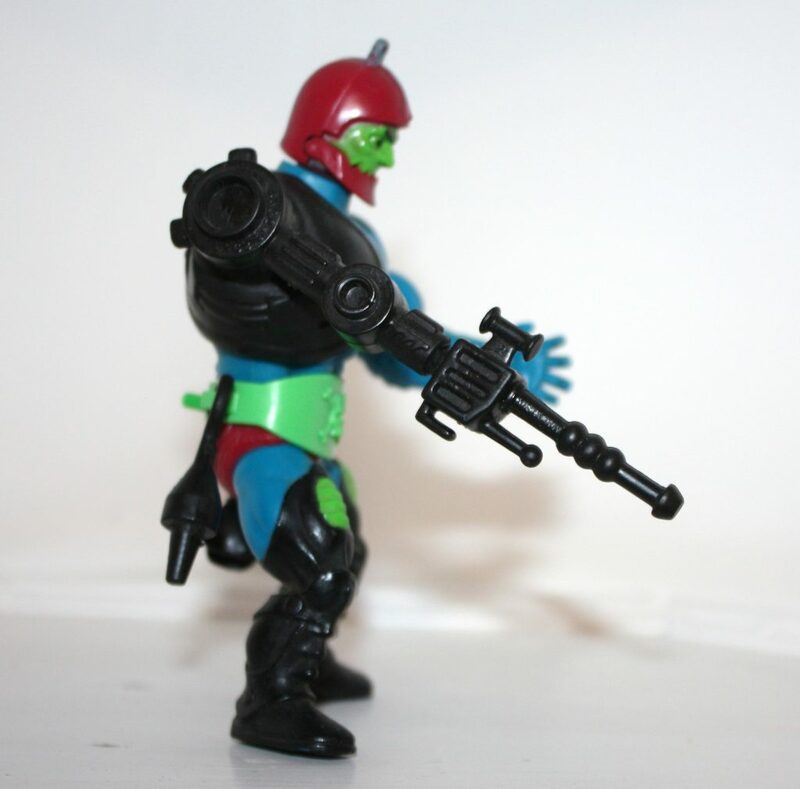 The blue of the body could vary to bold to quite dark; the belt could range from a bold green to a lighter green (as with the example shown in this article), and his helmet could range from rich-red to maroon. Oh how I *wish* I had photographed each variation in turn before I sadly had to sell the set on to keep afloat. 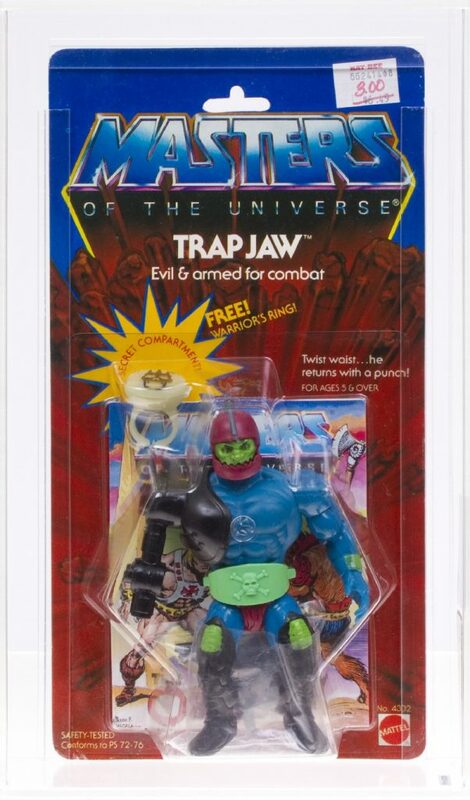 Looking back, it is maybe strange that the ‘free ring’ came with Trap Jaw, a figure already so adorned with extras. I can see why it came with Tri-Klops, who was more ‘standard’ and came with one weapon; Man-E-Faces came with the infamous additional weapons, but it’s odd they selected Trappy to also have the free ring, not one of the other less-adorned figures of the wave. 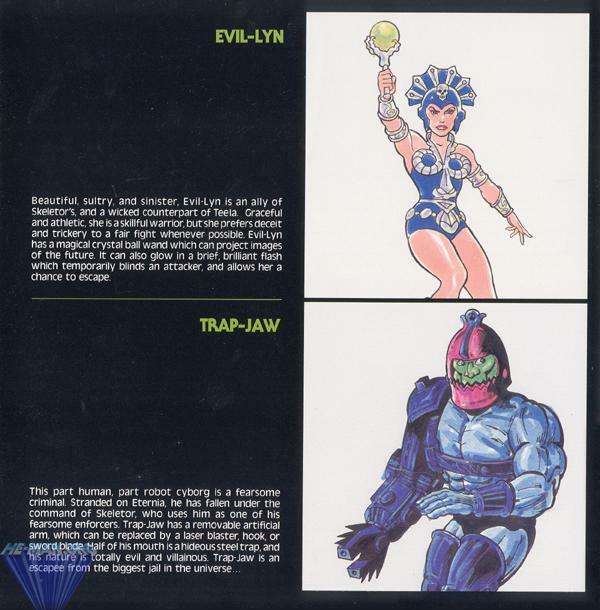 Some of the early literature, such as the Filmation Guide pictured, and the 1984 UK annual, mentioned Trap Jaw having escaped from Prison Star, a giant intergalactic spaceship where Eternia (or the Universe’s?) worst criminals were imprisoned. This seems to have been a concept Mattel dallied with for a while before letting it fade away; I wonder if a playset was ever considered? 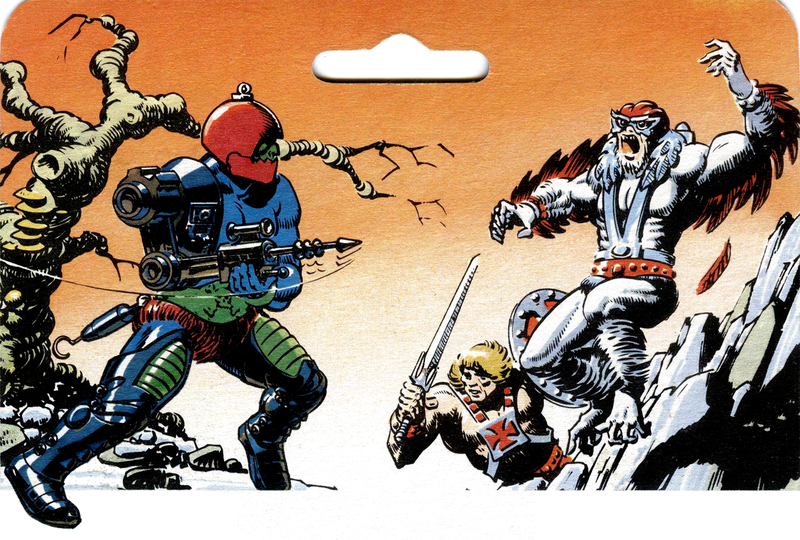 I often noticed the “missing jaw and shoulder section” illustration of Trap Jaw on the backs of some mini-comics and boxes. I personally always wondered if these illustations were compiled using different “layers” and they got mixed up in order before the final image. 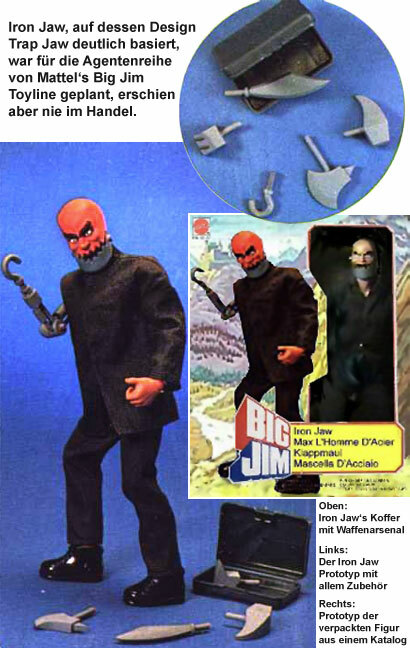 However, after seeing that promotional shot where the figure is indeed missing it’s jaw and shoulder piece, it seems feasible this illustrative mistake originated from here. 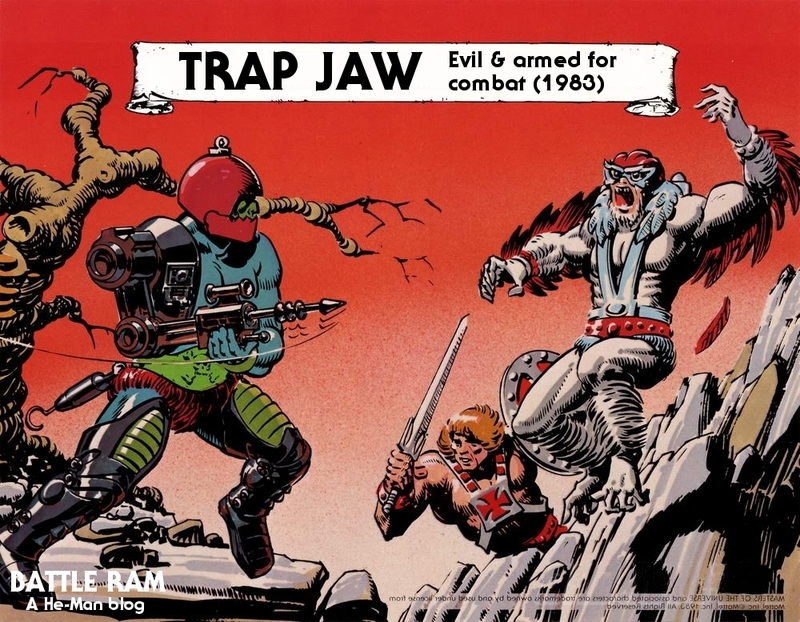 It is slightly ironic that this ‘wrong’ version of the illustration turns up on the back of Trap Jaw’s own box, where his complete jaw and arm section can visibly seen elsewhere on the card. I wonder why Mattel let this slip through and were so slack correcting it? I was appearing on mini-comic backs well into the third wave, so somebody really slipped up there. The Filmation version of TJ was typically dumbed down, but not in such a disappointing way as some other characters. 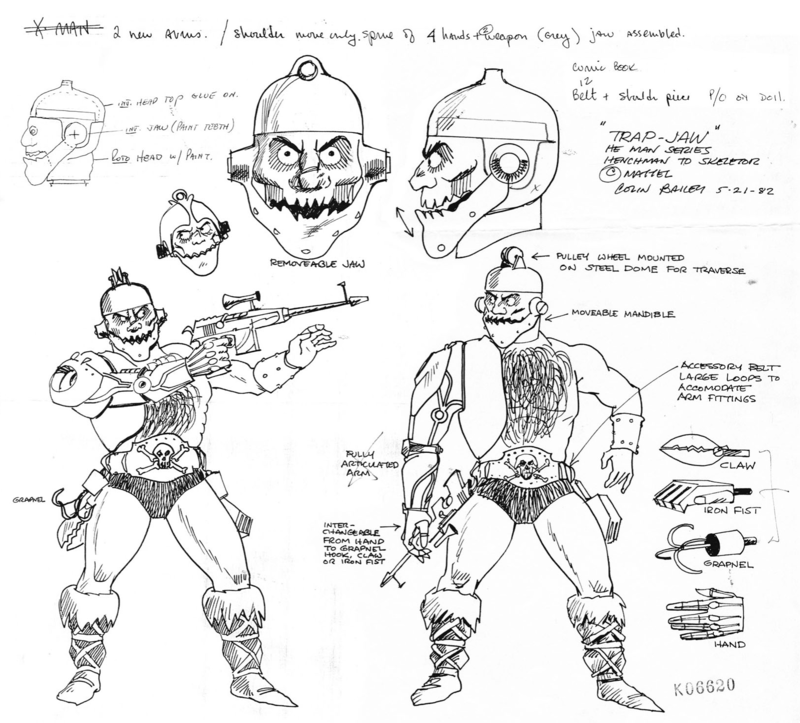 Don’t get me wrong, I woulda loved to have seen the psycho from another dimension from the mini-comics, but at least Filmation Trap Jaw had personality, and yes… even did seem oddly loveable at times, almost like a boisterous child trying to show off more than genuinely evil. I never liked his maroon arm and legs so much, but guessed it was for easy of animation. I never liked how his ar was way too short though, over-simplified for ease of animation. 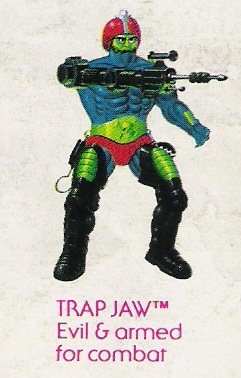 The 200x update of Trap Jaw, whilst quite different from the original, was one of my favourites from the 200x line. It was different in style to the original yet kept all of the key points, and looked huge and menacing. Possibly the best figure from the 200x line, or am I just biased. I hadn’t noticed the backwards TK armor. Good eye!